Clinique introduces its latest selection of Gifts that Give Back benefiting Happy Hearts Fund this holiday season, and I am always so happy to share these beauties. Not only are these gifts fragrant and beautiful, but they go toward a great cause. The Happy Heart Fund's mission is to rebuild safe, resilient schools in areas impacted by natural disasters. Clinique has committed to help Happy Hearts Fund build 100 schools by the end of this year by donating one million dollars to this fund - enough to build five schools around the world. By purchasing these Gifts that Give Back, you are supporting their contribution. 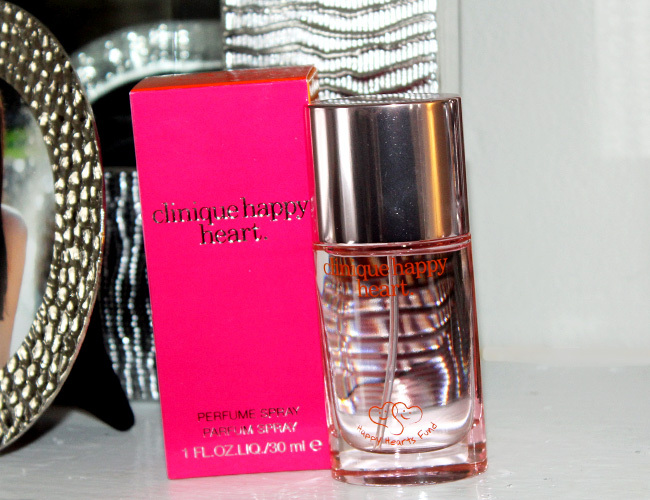 The newly designed limited edition Happy Heart fragrance featured a logo bottle and a super cute color block package in pink and orange. The scent is classic, and once you have it smelled it, it is one that you don't forget. It is a bright floral with hints of sweetness from mandarin orange and cassis mingled with soft floral notes of water lily, rose and geranium. Dry notes of sandalwood, musk and blondewood create a harmonious balance. The scent is meant to linger and enrich the heart while wearing. $10 from the sale of each fragrance will go directly to Happy Hearts Fund. This moisturizing lip colour balm in Plumped Up Pink is a sheer fuchsia shade that amplifies lips with a very natural looking pop of colour. The formula is very nourishing as it's loaded with mango and shea butters as well as antioxidants to help pamper and protect lips. Lips are felt moisturized immediately an it lasts through the day. $3 from the sale of each chubby stick will go directly to Happy Hearts Fund. Clinique's Gifts that Give Back are available now at all Clinique counters and clinique.com now.